Due to numerous applications producing noisy data, e.g., sensor data, experimental data, data from uncurated sources, information extraction, etc., there has been a surge of interest in the development of probabilistic databases. 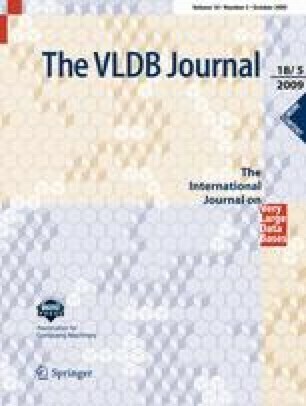 Most probabilistic database models proposed to date, however, fail to meet the challenges of real-world applications on two counts: (1) they often restrict the kinds of uncertainty that the user can represent; and (2) the query processing algorithms often cannot scale up to the needs of the application. In this work, we define a probabilistic database model, PrDB, that uses graphical models, a state-of-the-art probabilistic modeling technique developed within the statistics and machine learning community, to model uncertain data. We show how this results in a rich, complex yet compact probabilistic database model, which can capture the commonly occurring uncertainty models (tuple uncertainty, attribute uncertainty), more complex models (correlated tuples and attributes) and allows compact representation (shared and schema-level correlations). In addition, we show how query evaluation in PrDB translates into inference in an appropriately augmented graphical model. This allows us to easily use any of a myriad of exact and approximate inference algorithms developed within the graphical modeling community. While probabilistic inference provides a generic approach to solving queries, we show how the use of shared correlations, together with a novel inference algorithm that we developed based on bisimulation, can speed query processing significantly. We present a comprehensive experimental evaluation of the proposed techniques and show that even with a few shared correlations, significant speedups are possible.